Dayclub (noun): like a nightclub, but during the day. Take world-renowned DJs and add private cabanas, mixed drinks, champagne showers and bathing suits. Oh and a pool, don’t forget the pool. As temperatures rise on the Las Vegas Strip, the aroma of sunscreen-soaked revelry blends with the unmistakable fragrance of each casino brand. Follow your nose and you’ll find throngs of scantily clad partygoers lining up for entry to Las Vegas’ hottest dayclubs. 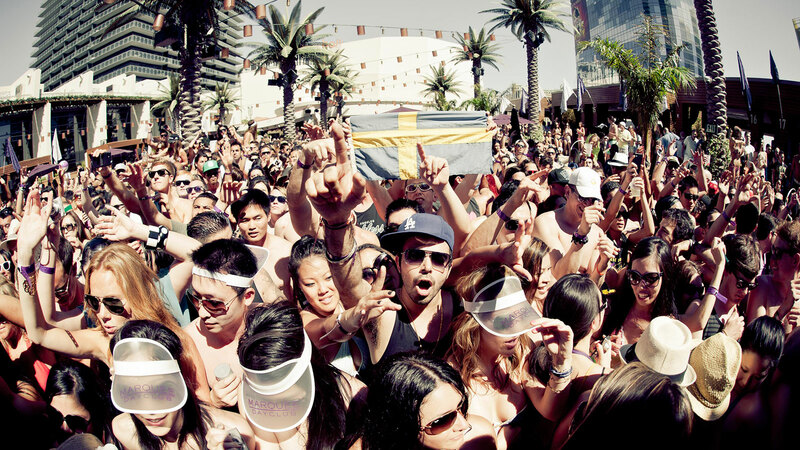 If you’re a newbie to the Vegas pool party scene, don’t sweat it–we’ve put together a little insider’s guide to help you make the most of your daylife experience. Work out for three-to-six months. Perfect your optimal beach body. Or don’t, and perfect radiating confidence instead. Remember to apply sunscreen generously and bring more with you to reapply later–sunburns are the mother of all buzzkills. Also, despite all the water surrounding you, it’s still a desert out there, so remember to hydrate (mixers don’t count). Drink plenty of water before, during and after the club. Ladies, bring your “A” game. Bikinis are encouraged, and so are heels. But keep in mind it’s daytime, so swap your stilettos for a classic wedge. This is far from your neighborhood pool, so plan on getting gussied up–full hair and makeup. Even better, dress up your bikini with a body chain or chunky necklace. Gents, this is the one time you won’t be turned away for wearing a t-shirt or a hat to the club. Embrace it. That being said, athletic wear and sneakers are still a no-go. Leave the Jordans at home and opt for a pair of leather flip-flops. Pair your sandals with board shorts and your favorite (waterproof) watch, and you’re set. DON’T: Walk around the resort in your skivvies. Instead, invest in a cute cover-up to wear until you’re inside of the club. Many casinos have policies about covering up. Who has time to be stopped by security? You’ve got champagne-soaked fun waiting for you. To Cabana or Not Cabana? Benefits of a cabana or daybed include bottle service, personal storage (two hands are often required when day raging), elbow room, a place to sit down, a place to eat, and most importantly, shade—a hot commodity in the desert, especially when temperatures crack triple digits. Usually, if you reserve a cabana or a daybed, your entry fee will be included in the cost—and you might even get to skip the general admission line. For the traveler on a budget, shelling out the cash for a cabana may be hard to swallow, so grab eight of your closest friends and split the bill. You’ll be glad you made the investment. DO: Book ahead of time. Cabanas and daybeds at Vegas hotspots like The Cosmopolitan are available in limited quantities and prices can increase quickly. If you don’t want to drop your cash on a cabana, make sure to bring a cross-body bag to carry your essentials. Some dayclubs also have lockers available for rent. However, your best bet is to leave all nonessentials in your hotel room. Should you want to take a dip in the pool, towels are usually provided, so don’t worry about bringing one. Also important–keep your shoes on unless you are going into the pool. You’ll be thankful for the layer between you and the sunbaked pavement. Have fun and turn up but don’t get sloppy–you need to maximize your time on The Strip. The average visitor is only here for 24 to 48 hours, and you don’t want to miss out on all the revelry because you’re too blotto from your day in the sun. DO: Always, always leave time for a power nap. You’ll need the energy before heading out again to conquer Vegas at night. I like your site, it has interesting articles, Thanks! Amen to all of the above. I couldn’t have written this better myself. Spend $1000 + to “party” with hundreds of people you don’t know? The premise is nice; pool, party, dj, men and women scantily dressed. But this is Las Vegas and it is nothing more than corporate entertainment at super inflated prices. No gracias. Start Discussion *Yawnnn… Reminds me of my high school days. Keeping the costs up does keep a lot of riff raff out. If you can’t afford it, don’t go. That Is cool. Do you go to other places in LV. ? Start Discussion *I love Pool parties at Vegas. Day parties/ dayclub sounds really fun! Good music, friends, drinks.. that’s life! Start Discussion * Go off strip to locals casinos if you want to save bucks and have better payouts. Most off strip locals casinos have meals for less than 10 bucks and drinks range from 2-5 bucks. On the strip most places charge in the 7-15 buck/drink range and meals are closer to 17-40 bucks. Most off strip hotel casinos rent rooms for about 30-50 a night (Sunday-Thursday weekends are much higher) but there is also a room tax of about 19 bucks to pay for the new stadium, big water pipe to lake mead and the convention center expansion. This fee keeps going up but I guess maybe someday it will drop back to the 12 buck range like it was not that many years back. I’m always amused when people say the food is cheap in Vegas. It always comes from those people that haven’t ever been obviously.There is nothing cheap about Vegas other than rooms at Luxor/Excalabur during certain times….Maybe! Personally I think 48 hours is all Vegas is good for, sleep on the plane ride home. Play big and go big. High stakes slots will eat up $500 in a few minutes but if you win you win big! It’s not where you go if you don’t want to spend a lot of money. DayClubs are ok, get a cabana with 8-10 people. I would have hated the experience without it. Ask for bottle specials, our group had 2 bottles of 50 cents vodka for 400 instead of Goose for 375. Still spent 1500+ a good ole American pretentious environment, but fun way to spend the day. Be prepared to spend your weeks worth of vacation money in 2 days and you’ll enjoy every minute. Big groups should stay at the Sky Suites at Aria, the club level drinks and snacks can save you a bunch of money each day. Mix bar on 52 floor of Mandalay Bay has the best views of Vegas. If you really want to do a week vacation rent a car with Fox rental car and head north into June Lk and Yosemite or west into Orange County. One way drop off’s with Fox are a few bucks. If you want to enjoy Vegas just make sure you’re out of there in 48 hours. 72-96 are my least favorite. My best times in Vegas have always been in the 24-36 hour range. Start Discussion *I love Vegas. Been there many times. Have family and friends. Invited some friends that never been before for Memorial Day weekend. We stayed at Bellagio, used the gym, the spa, the pool area. Family came through with a suitcase of top shelf liquor and beer. Son visited from Cali, got a daybed brought to the room for an additional cost. We ate good, had fun and enjoyed our stay. Did not do the buffet, prefer the chef tables for breakfast egg Benedict, hash browns, fresh fruit and momosa. Dinner the same. shrimp linguini, fresh salad vegetable of the season. Great Food. Went To Hoover dam, saw some shows. Got free VIP tickets to the club at the Bellagio, we got Tipsy before we left the room, we called the consieer and he escorted us to our table bypassed the lines. Purchased one round of drinks and had a great night. You pay for what you get, don’t cheat yourself. We drank, so we knew that was our most expensive item. Buy three or four half gallons, but always get a roomy room for guest to enjoy, that saves money. Start Discussion *Vegas is Awesome!!! But weekends are packed. Everything has gone up in price. But it’s basic supply and demand. Just imagine how ultra packed it would be if things were cheaper there, you wouldn’t be able to move!! So everyone grow up. Don’t go if you can’t pay. Entertainment is high outside of gambling because you’re not gambling the money away! Start Discussion *Comments so far have been about money. I read this article for kicks since I’m not a newbie to the DayClub scene. I’ve been to every one of them except for one. People complain about the cost of food. There are tons of great places to eat for about $15-$20 a person. These other comments are from people who don’t know where to go. And food quality is one of the best things about Vegas. Advice: don’t go to a steakhouse. You can get prime (best 2% of steak available) at Costco for less than half the price by throwing it in the oven with some salt and pepper. For $50 Kabuto has the best sushi I’ve ever tasted in my life. There’s cheaper fare at Tacos El Gordo ($2.50 tacos). House of Siam is also great. Try Yelp for cheap eats. There’s more options there than a person can go to in a single weekend. I don’t go to many shows but if I were to go to one, I’d go to the discount booth. The DayClub is different altogether. They are uber expensive. The article above has many great observations. Get a cabana and split the cost 8-10 ways if possible. Start Discussion *I go to Vegas with my wife about once a year to see a show, last week, show $318.00 , hotel $376 (NOT EVEN CLOSE TO THE STRIP, EAST SIDE CANNERY), I just added my food bills for 2 days 293.00 and NO, we did eat at a fancy restaurant either, we drove from Phoenix so gas about 90.00, I pretty sum if you ask me. I’d rather go to San Diego and the beach but VEGAS IS EXPENSIVE!!!!!!! Start Discussion * Vegas certainly has changed. I completely agree with the aforementioned statements in that what used to be the cheapest thing in Vegas i.e. “food”, is now the most expensive. Yes, it is overrated and everything except the hotels between Sunday night and Thursday night, are outrageously priced. I recommend “old Vegas” for those who want a nice time at an affordable price. Even then, you will spend a great deal on food and even the smallest shows are priced out of most people’s budgets. The ONLY way to stop the madness,, is not to go. Been to Vegas 3 times. If you act married (ie; with a partner) and stay in one of the better hotels, you will get free show tickets. There are still a few cheap buffets on Freemont street (ya, old vegas), and most of the casinos comp drinks if you’re playing games. (find the $5 blackjack tables and order drinks!) Over all , if it’s your first visit, expect to spend 3x more than you budget since food & drinks cost a fortune. You can buy food at Walgreens and eat in your hotel to save $$. Take the free shuttle between casinos that runs up and down the strip. Start Discussion *there is nothing cheap in Vegas . Get ready to spend a lot of money . Old Vegas is cheaper that is the place to go . Vegas is overrated not what I expected and the food will cost you a lot of money . Eat off the strip at a chain restaurant if you can !